I'm so stoked! 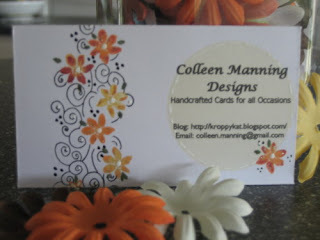 Amy Westerman over at Heartfelt Greetings http://heartfeltgreetings.blogspot.com/ held a contest for business card creations and my entry won! A big "Thank you" to Robbie for letting me know. Google Reader hadn't "fed" it to me yet, so I was clueless. I used a combination of two stamps for my entry. First, I stamped a small flower from Impression Obsession's Wreaths & Garlands - Floral (CL85) with my ColorBox Que Fluid Chalk ink pads. I then masked the flowers off and stamped with a Magenta border stamp. The number on the stamp is 140861K. I purchased it at Stamp Your Art Out in Cincinnati, Ohio, just recently and their stock # is 4289. The Magenta stamp is about 4 inches long, so only a portion of it would fit on my card. If you have any more questions or need clarification or more details on anything, please let me know. I'd be happy to hear from you. Congratulations! I love your design. I was so glad Amy held this contest - I was buried deep in a huge project and didn't have the time to enter, but I have been meaning to design some cards for myself and was so glad to get some ideas from Amy's contest. Again, congrats and I will start checking out your blog now that I have discovered it through Amy's blog. Congratulations, Colleen! You created an outstanding and functional business card! LOVE, LOVE, LOVE!!!! this card! You truly deserved to win....it was the BEST of the bunch! YGG!